Here’s another sneak peek recipe from my upcoming digital cookbook, The Grain-Free Snacker. The cookbook contains a variety of sweet and savoury snacks. This is one of my favourite savoury appetizers. I love munching on this on a Friday night while watching a romantic comedy on Netflix. This dip is amazing! I originally planned on pairing steamed artichokes with garlic aioli but as I was making the aioli, visions of bacon and spinach began dancing in my mind. These two ingredients really give this aioli a “wow” factor. 1. In a mixing bowl, combine Basic Aioli with the garlic, spinach, onion and bacon. Adjust for taste. Store in the fridge. 1. Trim the tips off the artichoke (optional). 2. Bring about a ½ inch of water to a boil in a pot deep enough to hold the artichoke standing up. Add the salt to the water. 3. Place the artichoke in the salted boiling water and cover the pot with a lid. Reduce the heat to maintain a steady simmer and cook for 20 minutes. 4. The artichoke is done when you can easily pull off a leaf. If this is too difficult, continue cooking, checking for doneness every five minutes. Depending on the size of your artichoke, this may take up to 40 minutes. 1. Using a blender or a powerful food processor, whip the egg yolk and mustard. 2. Turn the blender to the highest speed (I use the whipping cream speed) and SLOWLY add the olive oil one, drop at a time. Make sure it’s mixed in before slowly adding more. Store in the fridge until ready to use. 48 hours left to pre-order! Purchase The Grain-Free Snacker now for 75% off, while it’s still available for pre-order. This guarantees you the lowest price. Update pre-order period is over. You can purchase here. 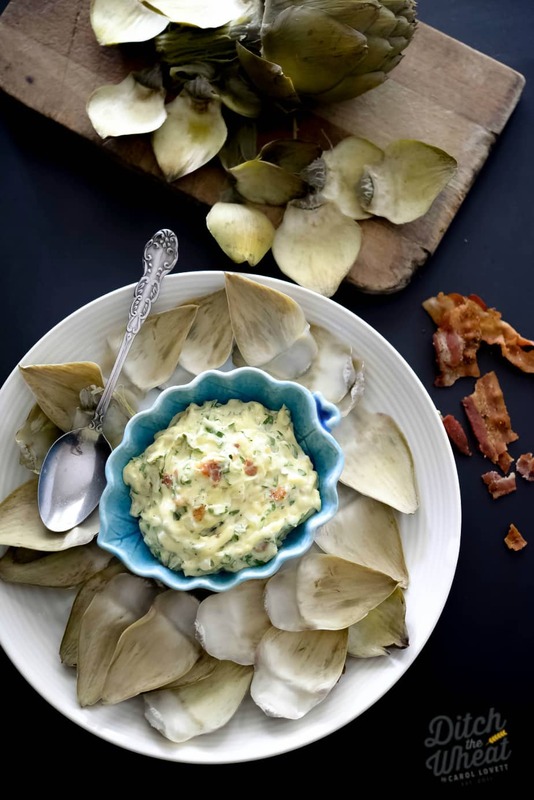 Looking forward to the book Carol 🙂 I’ve always had trouble with artichokes – I’m not sure if I just always pick bad ones, but I’ll try again so I can make this recipe!